How many of you just sung ♪ That’s Amore ♪ either out loud or in your head?? 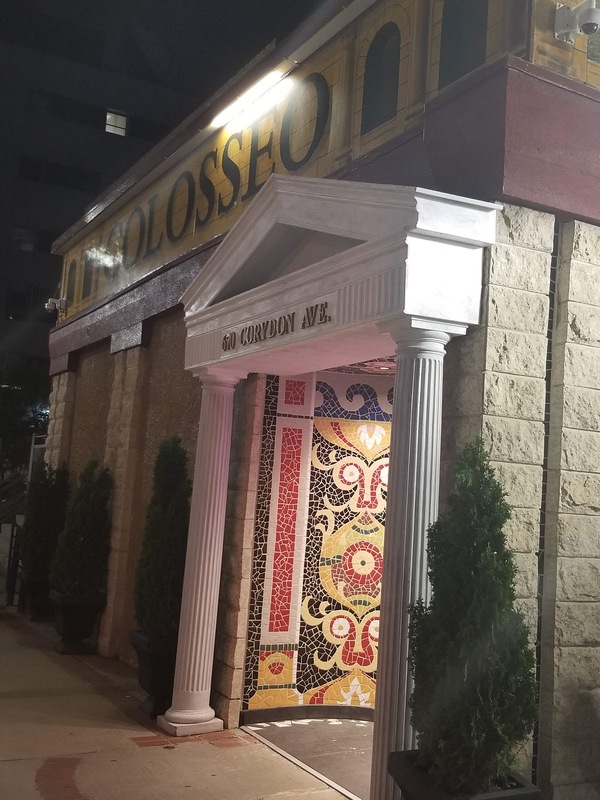 Somethings will never go out of style, and just like that classic Dean Martin song, when it’s date night, and I’m really craving pizza, one of the first places that pops into mind for me in this city is The Colesseo Restaurant on Corydon Ave.
Now Corydon Ave itself has always been a go to for my wife and I. We are both self proclaimed “people watchers”, and I find that on a beautiful summers night that we always end up walking up and down the avenue checking out the scene. 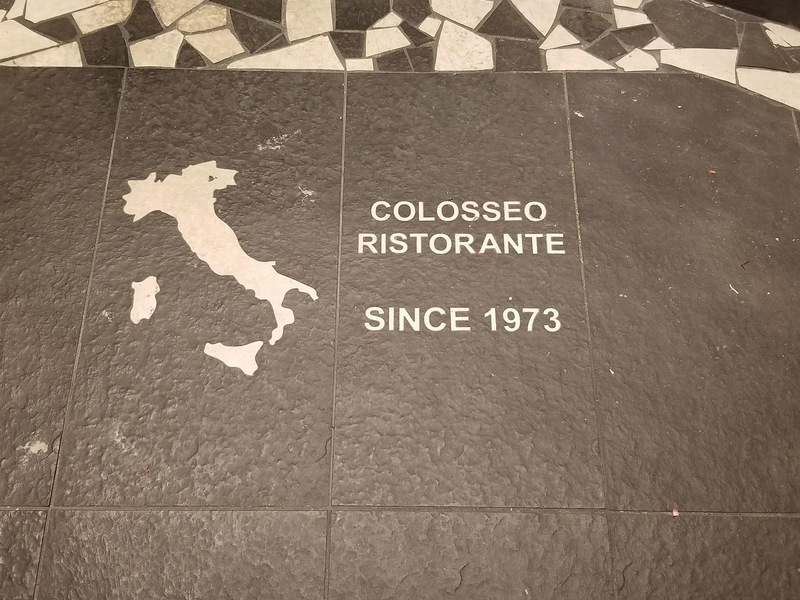 For me the Colesseo Ristorante is more than just great food, I love the overall pageantry of the place. The Water fountain, the tiled doorway. 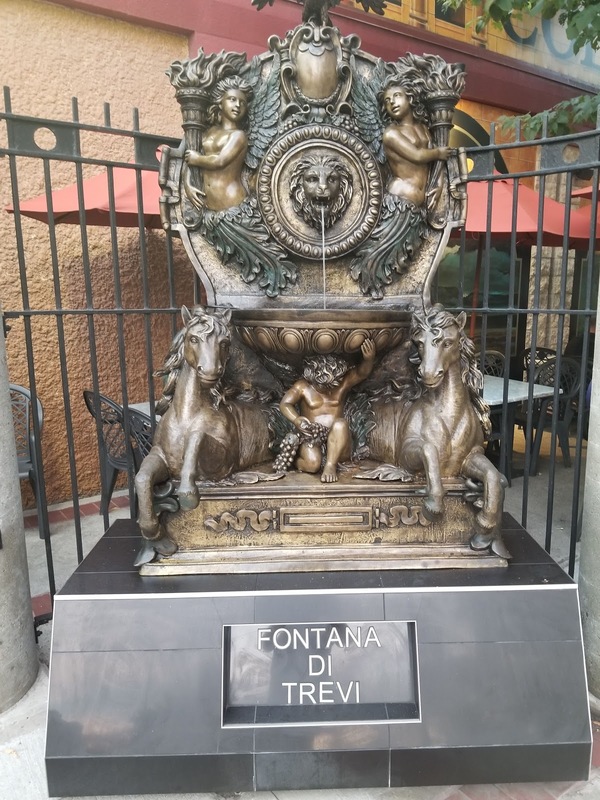 the elaborate art work on the walls and behind the bar, right down to the white table cloths and the napkin stuffed wine glasses, the atmosphere alone makes you feel like you are about to sit down for a dinner in Italy. This night my Wife and I decide to enjoy our meal outdoors. As you know there are only 2 main seasons in Winnipeg, Winter and Patio and with the terrific summer we are having we weren’t about to miss a second of it by eating indoors . Our waitress comes with our menus, and asks if we want anything to drink to start, only a pitcher of sangria will do on a beautiful evening such as this. The waitress leaves to put in our drink order, and my wife and I start the joyful conversation of catching up with each other with out any interruptions from little children while we flip through the menu. One of the waiters comes by with a pitcher of water, he quickly fills a glass for each of us and quietly slips away. Shortly after, our waitress returns with our Sangria, she pours us each a glass, and asks if we have made our choice for dinner. I always enjoy flipping through their menu. 12 pages of what feels to me like every Italian dish ever made, and even if the main ingredients in the dish are something you don’t normally eat, the names of the dishes alone like pollo alla principesa or scaloppine picatta lambata (try saying those and not doing an Italian accent at the same time 😊) make you want to order the dish none the less, but on this night we were here for pizza , and the winner form the speciality pizza list tonight was the Mediterrano. After a resounding review of our choice by our waitress, she hurried off to get our order into the kitchen, and after a glass of the sangria and some more delightful conversation our food was placed in front of us. The evening continued perfectly from there. I moved to the other side of the table so I could sit by my wife and watch the people as they came and went along Corydon. We enjoyed our pizza, we told stories, we topped up each others drinks until the pitcher was empty, the wait staff came quietly by and cleaned are plates as we finished them, and topped up our water glasses as needed, our waitress stopped by to make sure that our meal was to our satisfaction and to make sure that we were still doing OK through the course of the evening. It was a true Italian dining experience of great food and great conversation taking place over a couple of hours. 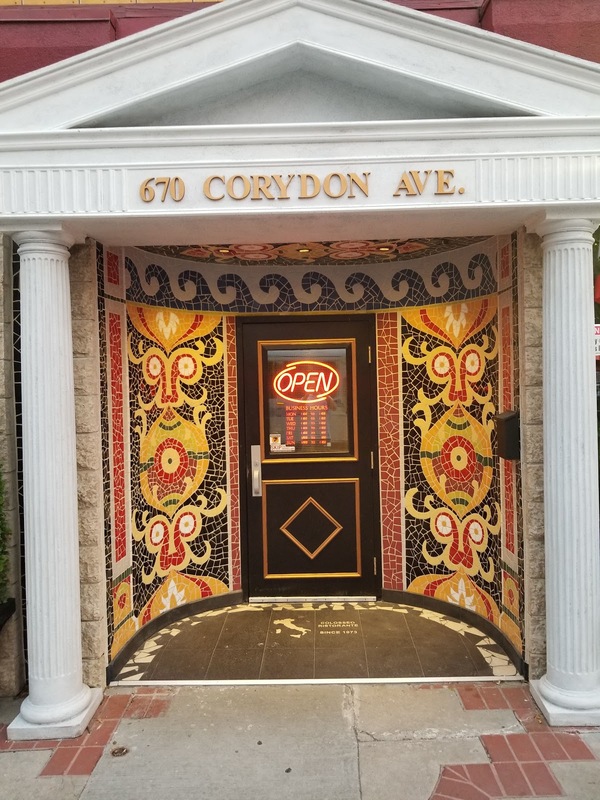 Once the food and drinks were gone, we wrapped up our conversation, I paid the bill, and we spent the rest of the night walking around Corydon and the surrounding streets, checking out the people, the music, and the architecture that surrounds our Little Italy. If you like what you have read today, please follow me at awateats on both twitter, and Instagram. 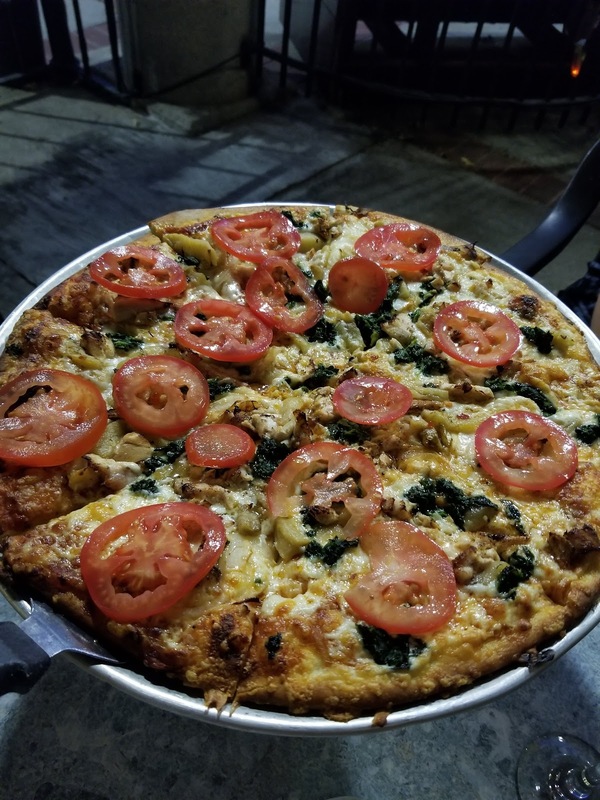 Feel free to share the link with your friends and family, and if there is a local place that you would like me to check out for you first or you think it is just so great that I have to go then please let me know in the comment section below or again on either twitter or Instagram.